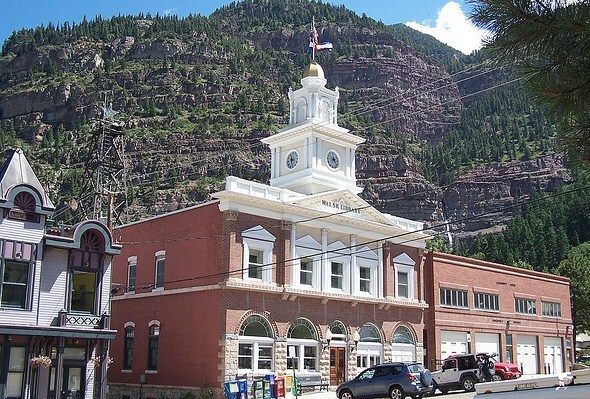 The Ouray City Hall and Walsh Library buildings were designed as a replica of Philadelphia’s Independence Hall, with a two-story red-brick building topped by clock tower and then a bell tower. They are listed on the National Register of Historic Places. The original brick, one-story City Hall was built in 1900 in Romanesque style, with two bays for fire trucks. After the building was completed, Tom Walsh, founder of the Camp Bird Mine, added a second story to house the library that bears his name in 1901. The second floor featured a Colonial Revival style façade with Doric columns supporting an inset balcony and was topped by the clock and bell tower. The building’s façade, however, was destroyed by fire in 1950, and volunteers replaced it with a utilitarian stucco front in 1953. A restoration effort in 1976 failed, but the historic façade and bell tower were brought back in 1988. The bell, which was cracked in two places when it crashed to the ground in the 1950 fire, sits on a foundation in front of the building.